The story and history of Saint Honoratus. 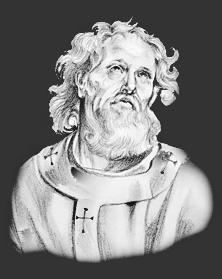 Saint Honoratus was of a consular Roman family settled in Gaul. In his youth he renounced the worship of idols, and gained his elder brother, Venantius, to Christ. Convinced of the hollowness of the things of this world, they wished to renounce it with all its pleasures, but a fond pagan father put continual obstacles in their way. At length, taking with them St. Caprais, a holy hermit, for their director, they sailed from Marseilles to Greece, with the intention to live there unknown in some desert. Venantius soon died happily at Methone, and Honoratus, being also sick, was obliged to return with his conductor. He first led a hermitical life in the mountains near Frejus. Two small islands lie in the sea near that coast; on the smaller, now known as St. Honoré, our Saint settled, and, being followed by others, he there founded the famous monastery of Lerins, about the year 400. Some of his followers he appointed to live in community; others, who seemed more perfect, in separate cells as anchorets. His rule was chiefly borrowed from that of St. Pachomius. Nothing can be more amiable than the description St. Hilary has given of the excellent virtues of this company of saints, especially of the charity, concord, humility, compunction, and devotion which reigned among them under the conduct of our holy abbot. He was, by compulsion, consecrated Archbishop of Arles in 426, and died, exhausted with austerities and apostolical labors, in 429. The Feast Day of Saint Honoratus is January 16. The origin of Feast Days: most saints have specially designated feast days and are associated with a specific day of the year and these are referred to as the saint's feast day. The feast days first arose from the very early Christian custom of the annual commemoration of martyrs on the dates of their deaths at the same time celebrating their birth into heaven.